Do Up Diary #41 It’s Daddy Dormer time! To get up into this newly created space, you go up the main house staircase to the top floor and through a door (below as seen from inside) into what used to be my office. This small office room will be transformed into an entrance way with steps up into the new dormer bedroom, but will also incorporated storage and shelving. 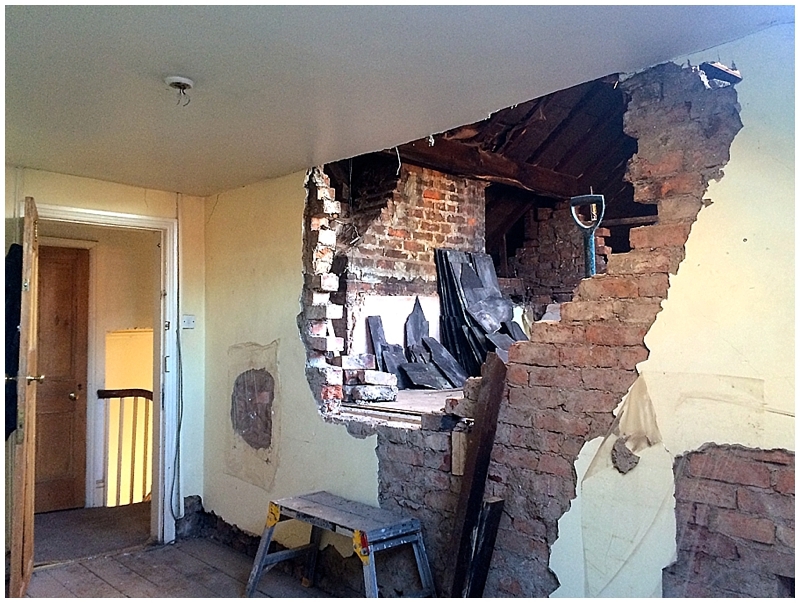 We’re currently knocking through the office wall to get into the opened up loft space – see below! 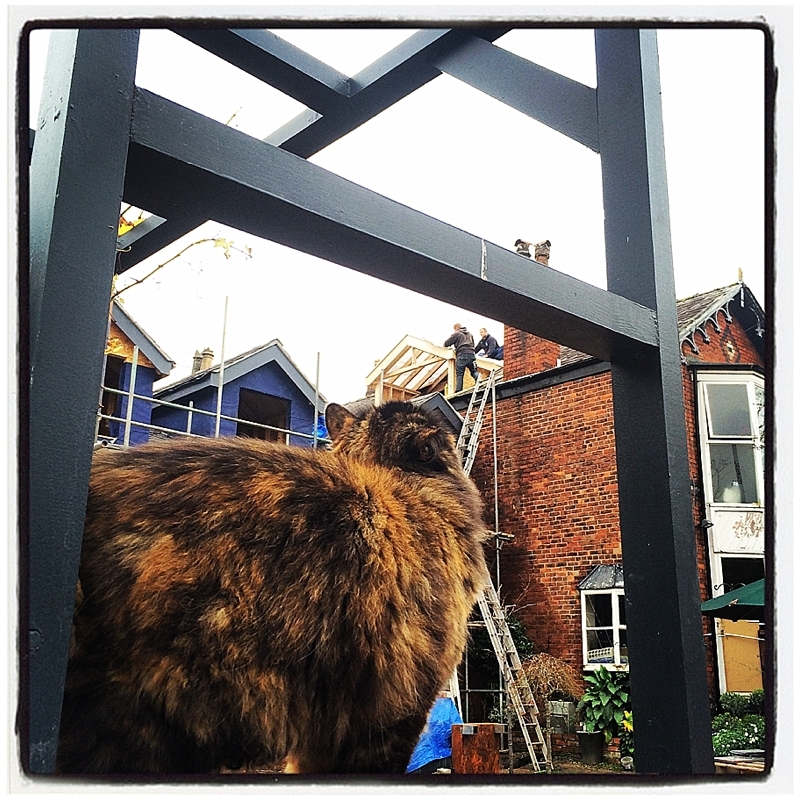 There was a bit of an issue when the lads starting setting out the dormer in that it was too small. Now, I understand that this sounds a bit bloody greedy given the size of the new build but I cannot tell you how many loft conversions I’ve been in which have been either poorly set out or designed at the very initial stages. Often they look great from the outside, sitting on the roof in the plans, but when you’re standing inside, ducking around low corners or stooping to get around the bed, the reality can be very different. 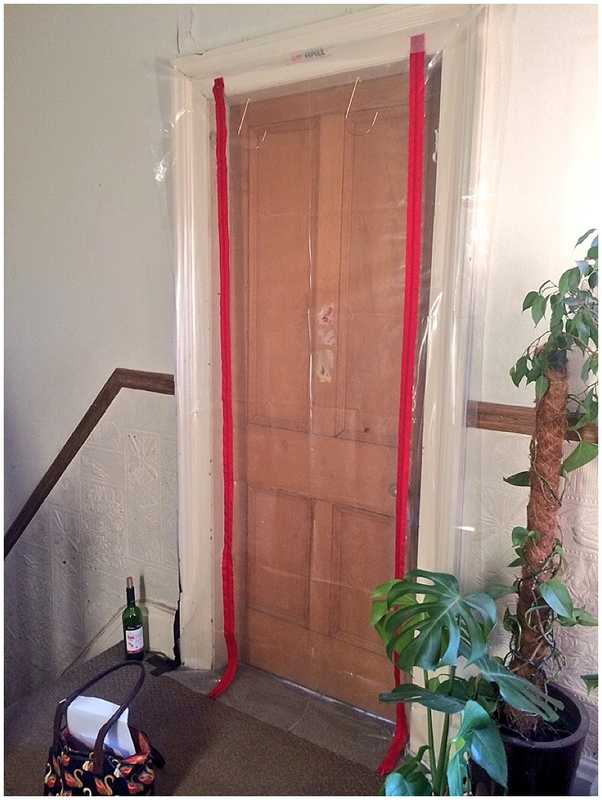 When I stood inside the room looking out, the right hand side needed to be moved about 500mm to the right, making the whole dormer slightly bigger but allowing anyone taller than 5’2″ to move around the room with ease, which they couldn’t have done if I’d left it how it was on the plans. 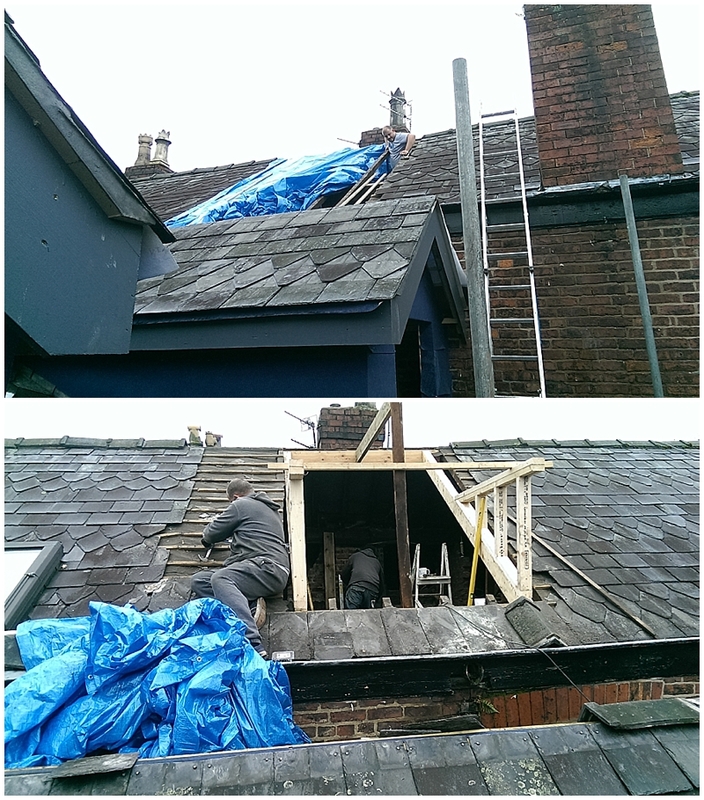 If you’re having a dormer built, I’d advise making sure you get up there, even when it’s all mucky and dirty, at the very initial stages and make sure all the head heights and positioning of walls is correct and adequate. 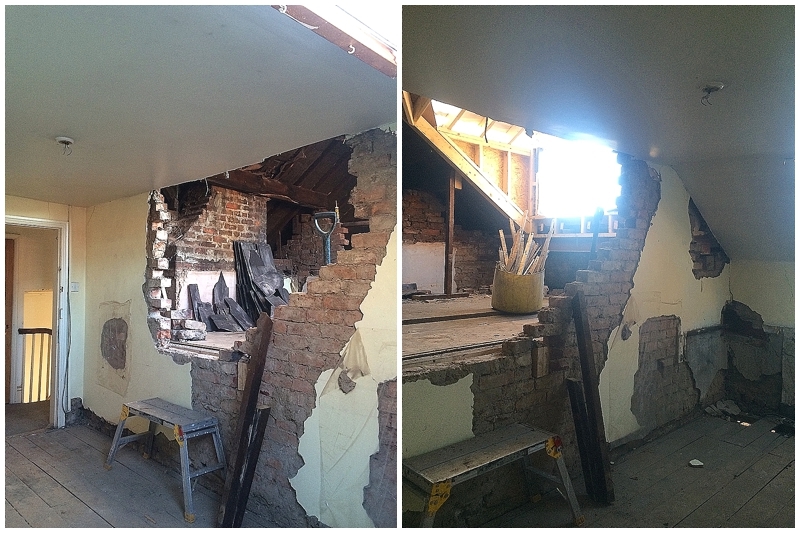 It can be very difficult for architects or left conversion companies to get a feel for a space until it’s actually opened up, so getting in there at the early stages is vital to check that it all works! When the room is done, I’ll do a video and show you what I mean and how important this was. 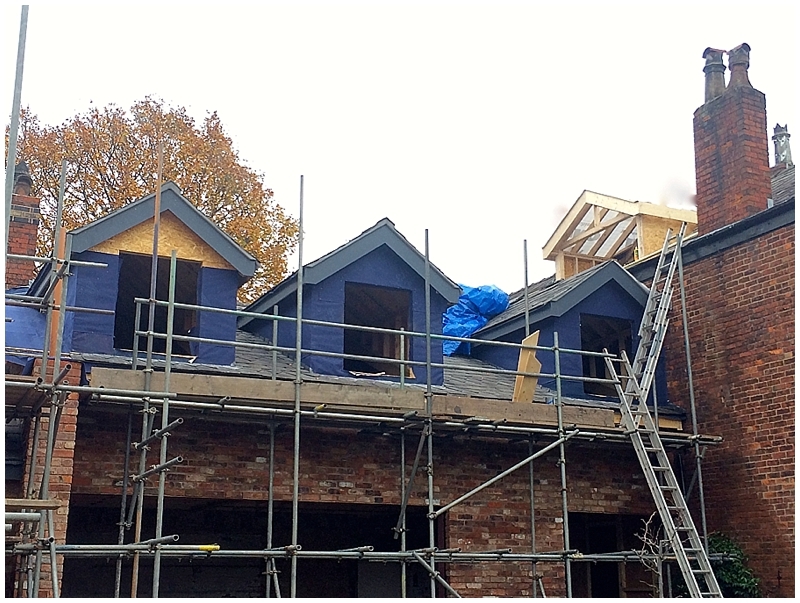 In the image below, more slates are being removed from the original roof to alter and extend the newly build timber side – thank goodness for an amenable and capable build team.